Is your Whirlpool Cabrio dryer giving you an F1 error code? 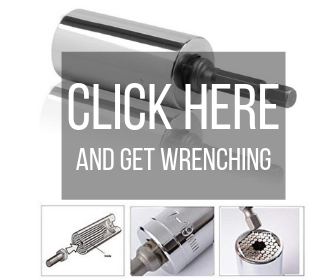 Have no fear because this post will show you how to fix it. The Whirlpool Cabrio dryer F1 error flashes when there is a miscommunication between the control board and the rest of your machine. Unplug your dryer from the wall outlet. Move your dryer away from the wall so you can access the control panel area. There are 2 screws located in the back of the control panel. The picture below is a Cabrio washing machine. 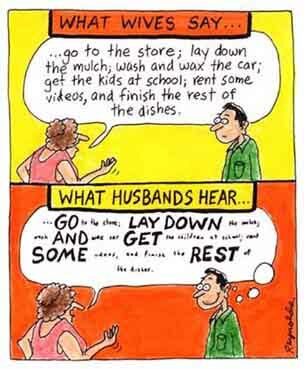 (I don’t currently have a pic for the back of the dryer.) 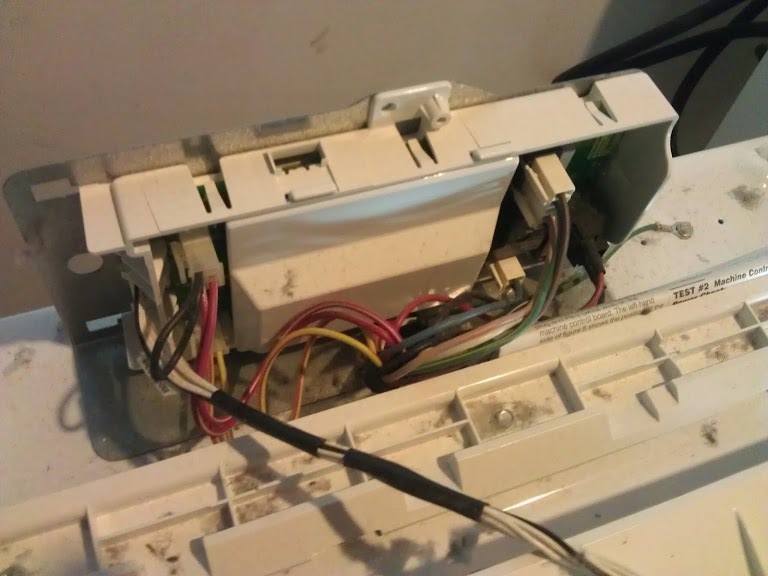 The only difference between the opening up the control panel on the washer and the dryer is that the washer has 3 screws and the dryer has 2, but anyways…. 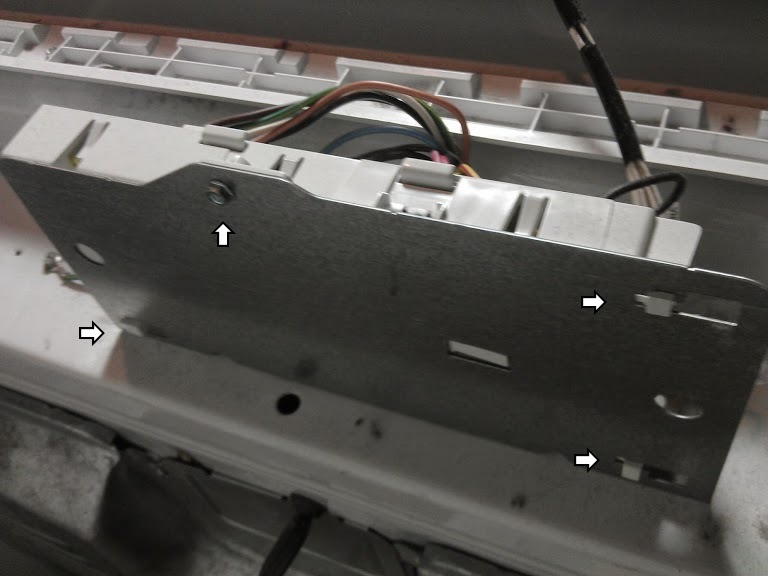 here’s the picture so you can locate the 2 screws on your dryer: You can click to enlarge any of the pictures below. If you find any loose plugs, plug them back into the control board. If you find damaged wiring, replace the wire. If you don’t find any of the above, replace the control board. To find the correct control board, you can use the search box below. To remove the control board you will first need to remove all the plugs that are attached to the control board. 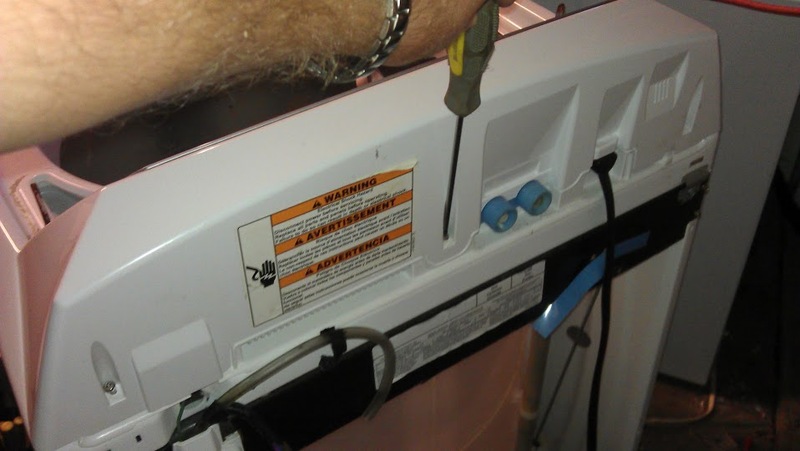 Make sure that your dryer has been unplugged from the wall outlet before attempting this repair. Next you will see one 1/4 hex head screw that needs to be unscrewed. Once this screw is removed and there are no wires attached to the board, the control board be removed. If you are standing at the back of the machine, all you have to do is slide it to the right. You can see the white arrows in the picture below. These little tabs and the previous screw that you removed are the only items that are holding the control board in place.